As the bingo industry moves into its third year of working with Variety, the children's charity, it is clear that bingo players and clubs all love Variety. Following the fantastic results in 2015 and 2016, that saw the industry raise over £500,000, this year looks set to be another record breaking year, as licensed bingo clubs across the UK aim to beat their target of £1 million by 2018. While, the main fundraising week this year is set for 28th August, many clubs and operators have got a head start on the year and some have just kept on going. Gala Bingo got things underway early, determined to smash the amount raised last year out of the ballpark and are hoping to raise £250,000. Kicking off in May, Gala launched a new in-house game, where customers call a special number to win, when they will be given the chance to double their prize money. The game, launched in Gala Bingo Feltham, is played at all 127 Gala clubs, with a proportion of the ticket price being donated to Variety. To help launch the game Variety supporter, comedian and actor Bobby Davro agreed to get things started and played the first game. Majestic Clubs also got firmly into the swing of things, again starting fundraising early with a sponsored abseil down the ArcelorMittal Orbit observation tower, in London's Queen Elizabeth Olympic Park. Earlier this year, in May, at The Bingo Association's Annual Charity Golf Day and Dinner, another Sunshine Coach presentation was made. The Golf Day was held at The Celtic Manor in South Wales, so leading Wales based national operators Castle Bingo were asked to lend their support in making the latest presentation to Llanishen Fach Primary School. Llanishen Fach Primary School is a mainstream school with a Special Needs Resource base for up to 20 pupils aged 5-11 years of age, who primarily need to develop their speech and language skills. The School is fully committed to integrating the children with special needs with mainstream classes. 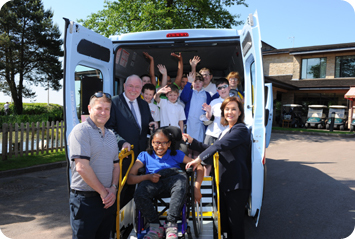 The new specially adapted minibus, with wheelchair access, will be instrumental in enriching their learning experience. It will allow them to travel and attend activities with their peers. The opportunities afforded to the children will develop their social skills, independence and build their confidence for future challenges. This is the sixth Sunshine Coach to be provided by The Bingo Association in the past two years, with the seventh and eighth already scheduled to be presented in September to Newton's Walk Pupil Referral Unit in Derby and Drunmore School in Glasgow. Variety, the children's charity in the UK is part of an international charity with each country and state (as is the case in the USA and Australia) being given a 'tent' number and in the UK that Variety Tent number is 36. Each year 37 Variety 'tents' around the globe are invited to nominate supporters to be the recipient of a Variety International Award. Tent 36 (Variety in the UK) was delighted to nominate The Bingo Association to receive a Variety International Corporate Award in 2017, which the Association gratefully accepted on behalf of its members and bingo customers who have helped make the campaign such a great a success. Lexham House, 75 High Street North, Dunstable, Beds. LU6 1JF.